We have attendance data on 314 high school juniors from two urban high schools in the file nb_data. The response variable of interest is days absent, daysabs. The variable math gives the standardized math score for each student. The variable prog is a three-level nominal variable indicating the type of instructional program in which the student is enrolled. ## "M (SD) = 10.65 (8.20)"  "M (SD) = 6.93 (7.45)"  "M (SD) = 2.67 (3.73)"
Negative binomial regression -Negative binomial regression can be used for over-dispersed count data, that is when the conditional variance exceeds the conditional mean. It can be considered as a generalization of Poisson regression since it has the same mean structure as Poisson regression and it has an extra parameter to model the over-dispersion. If the conditional distribution of the outcome variable is over-dispersed, the confidence intervals for the Negative binomial regression are likely to be narrower as compared to those from a Poisson regression model. Zero-inflated regression model – Zero-inflated models attempt to account for excess zeros. In other words, two kinds of zeros are thought to exist in the data, “true zeros” and “excess zeros”. Zero-inflated models estimate two equations simultaneously, one for the count model and one for the excess zeros. Below we use the glm.nb function from the MASS package to estimate a negative binomial regression. R first displays the call and the deviance residuals. Next, we see the regression coefficients for each of the variables, along with standard errors, z-scores, and p-values. The variable math has a coefficient of -0.006, which is statistically significant. 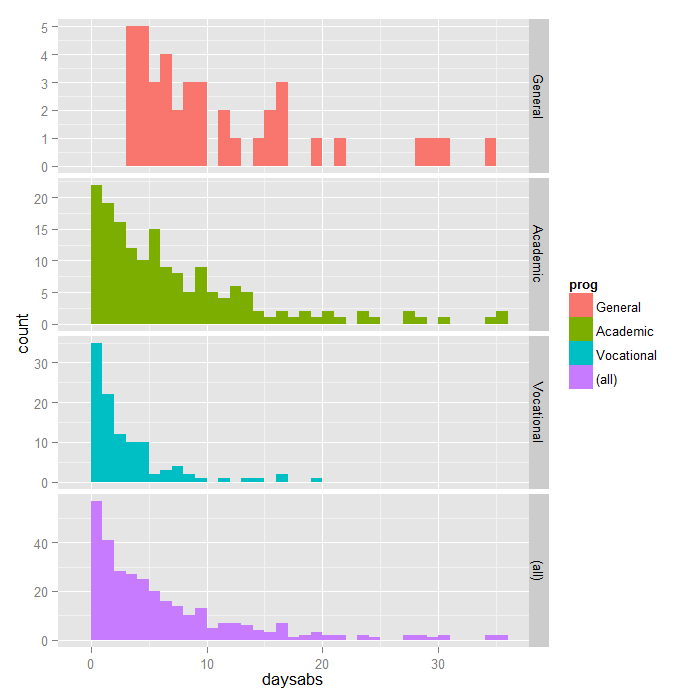 This means that for each one-unit increase in math, the expected log count of the number of days absent decreases by 0.006. The indicator variable shown as progAcademic is the expected difference in log count between group 2 and the reference group (prog=1). The expected log count for level 2 of prog is 0.44 lower than the expected log count for level 1. The indicator variable for progVocational is the expected difference in log count between group 3 and the reference group.The expected log count for level 3 of prog is 1.28 lower than the expected log count for level 1. To determine if prog itself, overall, is statistically significant, we can compare a model with and without prog. The reason it is important to fit separate models, is that unless we do, the overdispersion parameter is held constant. ##         Model  theta Resid. df    2 x log-lik. Test    df LR stat. The two degree-of-freedom chi-square test indicates that prog is a statistically significant predictor of daysabs. The null deviance is calculated from an intercept-only model with 313 degrees of freedom. Then we see the residual deviance, the deviance from the full model. We are also shown the AIC and 2*log likelihood. The theta parameter shown is the dispersion parameter. Note that R parameterizes this differently from SAS, Stata, and SPSS. The R parameter (theta) is equal to the inverse of the dispersion parameter (alpha) estimated in these other software packages. Thus, the theta value of 1.033 seen here is equivalent to the 0.968 value seen in the Stata Negative Binomial Data Analysis Example because 1/0.968 = 1.033. As we mentioned earlier, negative binomial models assume the conditional means are not equal to the conditional variances. This inequality is captured by estimating a dispersion parameter (not shown in the output) that is held constant in a Poisson model. Thus, the Poisson model is actually nested in the negative binomial model. We can then use a likelihood ratio test to compare these two and test this model assumption. To do this, we will run our model as a Poisson. In this example the associated chi-squared value estimated from 2*(logLik(m1) – logLik(m3)) is 926.03 with one degree of freedom. This strongly suggests the negative binomial model, estimating the dispersion parameter, is more appropriate than the Poisson model. We can get the confidence intervals for the coefficients by profiling the likelihood function. We might be interested in looking at incident rate ratios rather than coefficients. To do this, we can exponentiate our model coefficients. The same applies to the confidence intervals. The output above indicates that the incident rate for prog = 2 is 0.64 times the incident rate for the reference group (prog = 1). Likewise, the incident rate for prog = 3 is 0.28 times the incident rate for the reference group holding the other variables constant. The percent change in the incident rate of daysabs is a 1% decrease for every unit increase in math. The coefficients have an additive effect in the (ln(y)) scale and the IRR have a multiplicative effect in the y scale. The dispersion parameter in negative binomial regression does not effect the expected counts, but it does effect the estimated variance of the expected counts. More details can be found in the Modern Applied Statistics with S by W.N. Venables and B.D. Ripley (the book companion of the MASS package). For assistance in further understanding the model, we can look at predicted counts for various levels of our predictors. Below we create new datasets with values of math and prog and then use the predict command to calculate the predicted number of events. First, we can look at predicted counts for each value of prog while holding math at its mean. To do this, we create a new dataset with the combinations of prog and math for which we would like to find predicted values, then use the predict command. In the output above, we see that the predicted number of events (e.g., days absent) for a general program is about 10.24, holding math at its mean. The predicted number of events for an academic program is lower at 6.59, and the predicted number of events for a vocational program is about 2.85. Below we will obtain the mean predicted number of events for values of math across its entire range for each level of prog and graph these. 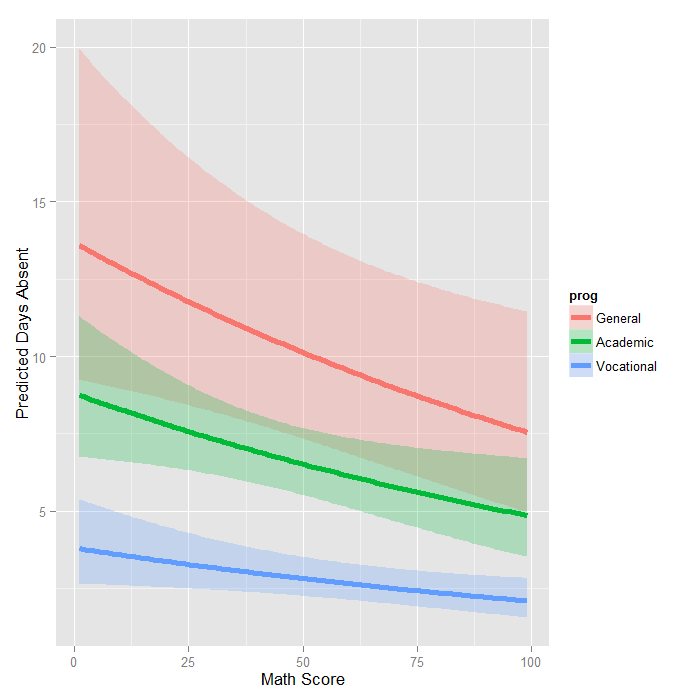 The graph shows the expected count across the range of math scores, for each type of program along with 95 percent confidence intervals. Note that the lines are not straight because this is a log linear model, and what is plotted are the expected values, not the log of the expected values. One common cause of over-dispersion is excess zeros by an additional data generating process. In this situation, zero-inflated model should be considered. Count data often have an exposure variable, which indicates the number of times the event could have happened. This variable should be incorporated into your negative binomial regression model with the use of the offset option. See the glm documentation for details. The outcome variable in a negative binomial regression cannot have negative numbers. You will need to use the m1$resid command to obtain the residuals from our model to check other assumptions of the negative binomial model (see Cameron and Trivedi (1998) and Dupont (2002) for more information). Venables, W.N. and Ripley, B.D. 2002. Modern Applied Statistics with S, Fourth Edition. New York: Springer.